The Spring 2019 Intake Season is upon us and the dates are from Sunday, January 13 through Sunday, April 21, 2019. Thursday, March 21st, 2019 is the deadline for Collegiate MIP requests. Training will be held via a very efficient online format. We have set up five (5) dates for this cycle. Each session will be held via WebEx. Registration will be cut off two (2) days prior to each training date to allow for scheduling and administrative work. These will be the only sessions and no make-ups will be available. You will not be able to get M.I.P. certified outside of these sessions. The benefits of M.I.P. certification include being able to attend M.I.P. training sessions, the right to be on an M.I.P. Team, the right to actively participate on an Initiation Team and the benefit of being covered by our fraternal insurance during the intake process. You must be financial to receive all these benefits. The training can be taken on PC, Mac or even a mobile device such as a tablet or smart phone (Android or iOS). You will then be added to the list of certified MIP Trained Eastern Region members. Below are the upcoming training dates and the corresponding registration links. Please note there is a different registration link for each training date. If you’ve taken and successfully passed the exam during our Fall 2018 training, you do NOT need to retake the MIP certification exam until Fall 2019. Please save the following dates so you can be at the retreat closest to you. The Northern Leadership Retreat will be held Friday September 22nd and Saturday September 23rd at the Rutgers University Medical School, 185 South Orange Avenue Newark, New Jersey 07103. This is for New England, New York, New Jersey, and Pennsylvania states. Please click on the following link to register for the Leadership Retreat and fill out the form carefully so any dietary needs can be addressed. 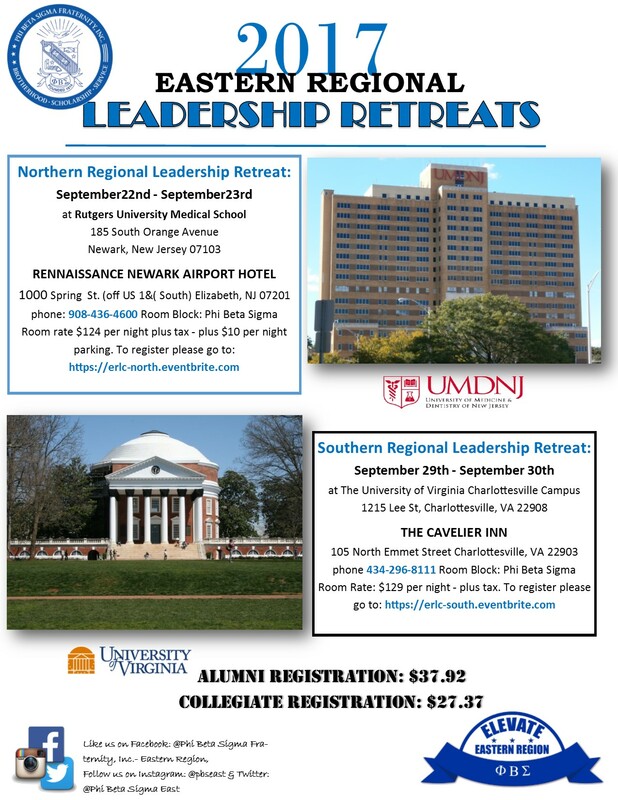 The Southern Leadership Retreat will be held Friday September 29th and Saturday September 30th at the University of Virginia Charlottesville Campus, 1215 Lee Street Charlottesville, VA 22908. This is for Delaware, D.C., Maryland, Virginia, West Virginia states. Please click on the following link to register for the Leadership Retreat and fill out the form carefully so any dietary needs can be addressed. 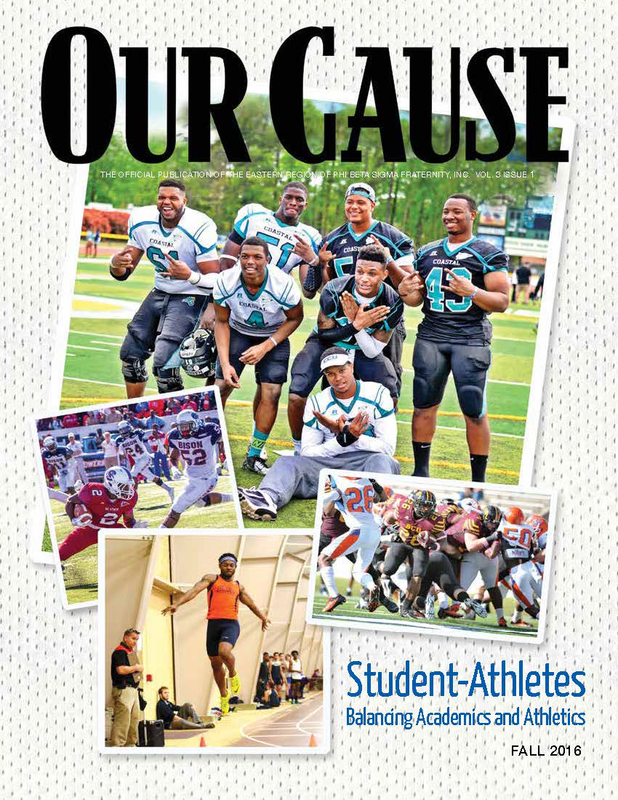 Please click the link bellow to download and print the Winter 2017 Phi Beta Sigma Eastern Regional Our Cause Magazine. Please save the dates so you can be in attendance at the 2018 Eastern Regional Conference in Baltimore, Maryland. To get more information about the 2018 Eastern Regional Conference in Baltimore or to register for the conference please click on the link below. Please note you must be a registered conference attendee to be able to reserve your room under the conference room block. On August 29th by direction of our Eastern Regional Director, Hon. Brother Devon Henry all previous M.I.P. certifications will become invalid. Since all M.I.P. certifications are good for one year this will mark the end of your valid period. You must be recertified during this cycle if you want to be M.I.P. certified for 2017-2018. The Fall 2017 M.I.P. Training window is upon us. Training will be held via a very efficient online format. We have set up ten (10) dates for this cycle. Each session will be held via WebEx. Registration will be cut off two (2) days prior to each training date to allow for scheduling and administrative work. These will be the only sessions and no make-ups will be available. You will not be able to get M.I.P. certified outside of these sessions.